You are here: Home / Everyone loves coffee! Many people cannot start the day without a hit of caffeine, with approximately 70 million cups of coffee drank in Britain on a daily basis! The industry is approximated to be worth 1 billion pounds a year. But it looks like a niche in the market has been overlooked? 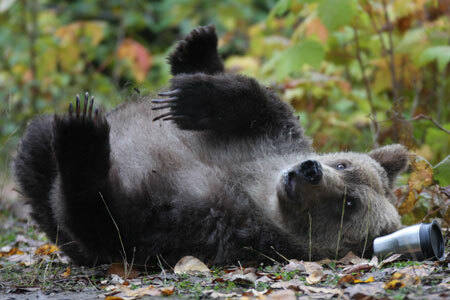 That’s right, when this bear came across this discarded cup he fell head over heels. Bears have the best smell in the business. A polar bear can smell a seal through 6 inches of ice and in the North of America they have become more dangerous as they come into camps searching for a free meal. Campers and hikers are constantly advised to keep all food locked away although it seems all they need is a cup off coffee to tame these wild beasts!